Johnson School fifth graders traveled "off-island" yesterday to the Lynn Water Treatment Plant. Students investigated how Nahant's waste water is transformed from "Yuck" to "Yup" in a matter of hours. Part of the visit included a tour of the facility's wind turbine. Students were even invited to autograph its interior walls! 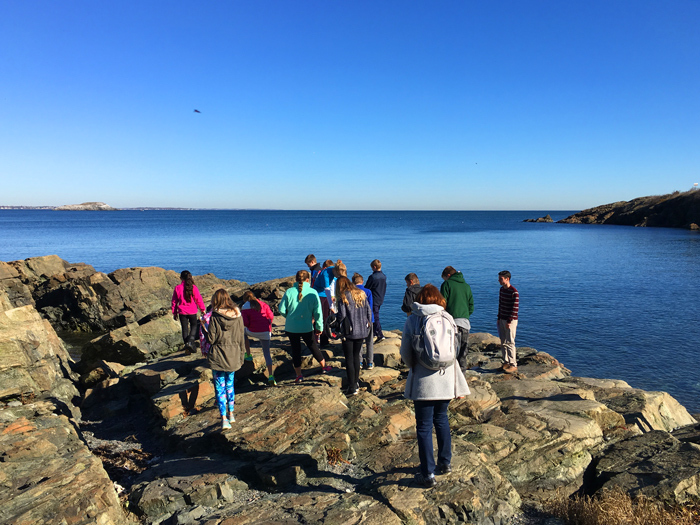 Special thanks to Mrs. Tibbo for sharing the photo—and for guiding the class—along with Mrs. Tarmy and the Northeastern University Marine Science Center outreach instructors! This marine science program is made possible by a grant from our foundation. The Nahant Education Foundation sponsored a Skype call with the Johnson School third and fourth graders and Katie Shusdock, a Northeastern University co-op student working at Palmer Station, Antarctica. Enjoy a wonderful article by Bridget Turcotte in today's Lynn Item. Dr. William Detrich, professor of biology, chemistry and marine biology at Northeastern, and Val Perini, outreach instructor at the Marine Science Center, led the conversation with Katie. Perini said the relationship between the Marine Science Center and the Johnson School has strengthened over recent years in large part because of the programming the [Nahant Education] foundation funds.